I have a small study room about 11o square feet; and at times it can be quite warm during the evening when there is no breeze coming in from the windows. I have went to the electrical store to browse at portable air conditioners and there were quite a few brands and models to choose. 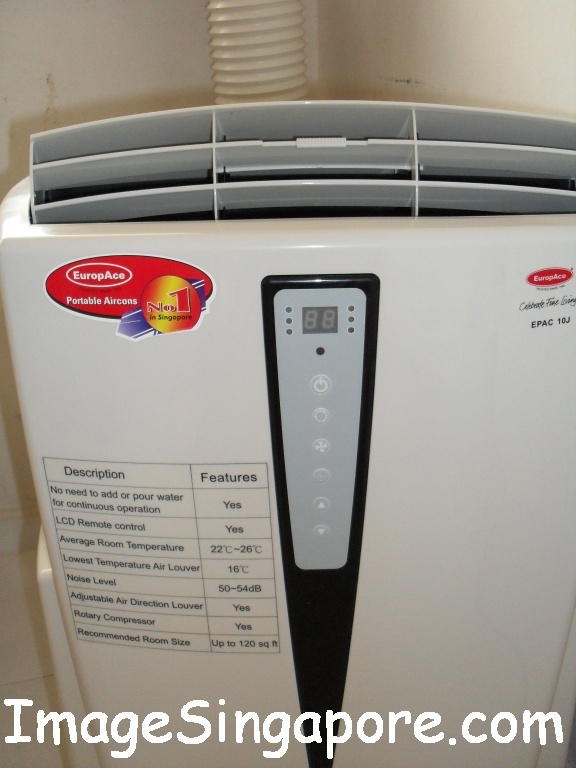 Finally I decided to purchase the EuropAce portable air conditioner and the model is EPAC 10J. Accordingly to the specifications stated in the brochure, the EuropAce EPAC 10J has a cooling capacity of 10,000 BTU at 2.9kw and has air flow of 300 m3/hr. It is quite heavy with a weight of 34kg and it uses the R-410A coolant. The thing I liked about this portable air conditioner was that it has the condensation elimination system – therefore it is drainless and you don’t have to worry about draining out water daily. It comes with a rather small size remote control and has 3 level of fan speed and a 24 hours timer. The technician came during the afternoon to install the air conditioner in my room. The first thing was to fix the PVC frame on my sliding window; he secured the PVC frames with screws drilled into the window frames. Thereafter he affixed the long hose with one opening on the PVC frame with a hole slot provided in the frame; and then slot the end of the hose into the back of the portable air conditioner. And then he simply turned on the power and the air conditioner started to work. I could feel the cold air flowing out of the air outlet within a few minutes. I turned on the portable air conditioner during the night at about 9pm and noted that the sound from the compressor was actually louder that it was during the day. Probably during the night the noise was more distinct. I tried to lower the temperature to 20C but the air conditioner would still indicate the room temperature of 24C. I realized that this EuropAce portable air conditioner could only provide a default room temperature of between 22C to 26C. I am not able to set the temperature as it would still go back to the default room temperature. This is what I disliked about this portable air conditioner. After more than 2 hours of operation, my study room was not cool enough even though I turned on the speed of the fan to the maximum. The rubber hose which draws the hot air from the air conditioner out to the window was very warm. I wondered whether the very warm rubber hose had in fact aided in increasing the room temperature. After 2 days of use, my conclusion was that the EuropAce was not my ideal portable air conditioner. The room was not cool at all and I was unable to lower the temperature as it is always set on default of 24C. The noise level was quite distinct and loud during the night and I am not comfortable with a very warm rubber hose inside the room. 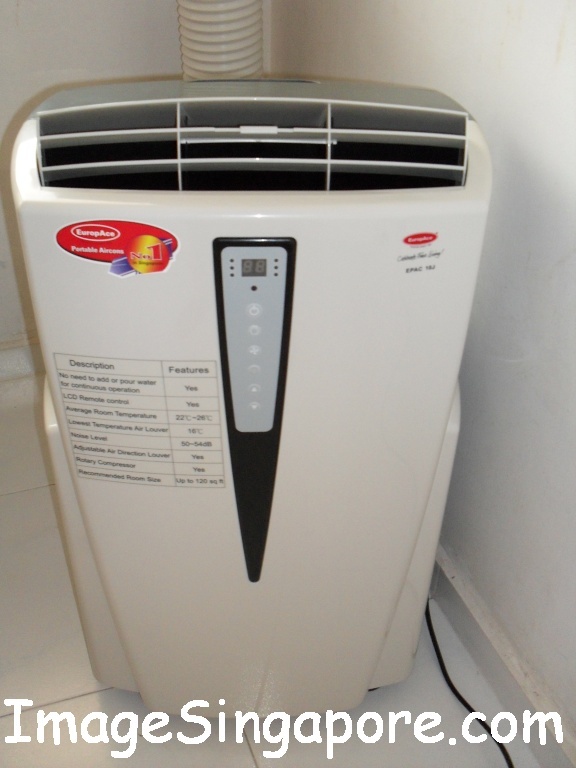 As the purchase of this EuropAce air conditioner was under a no question asked return policy for a few days trial, I promptly went to the store and told them of my unhappiness with this portable air conditioner. I told the staff and he recommended a casement window unit air conditioner for my room. I took up the offer and hoped that this time it would be a better conditioner. I have only 2 concerns – first it must be cool enough – this means that I can adjust the coolness of the air conditioner to my requirement; and secondly it should be quieter. If you want to know the outcome/review of the window casement air conditioner that was installed just a few days ago, I will post my review in another blog.